The U.S. National Park Service celebrates its centennial in 2016, and there is much publicity surrounding the best known of our national treasures. While people are familiar with many of the 59 parks that NPS is charged with protecting and preserving, they may not realize that 112 official monuments also come under the auspices of NPS. The monuments are all different, but each has a significant place in our country’s historic or scenic landscapes. In this post, I’m commemorating the centennial by highlighting a couple of my favorites. Teddy Roosevelt, and Lincoln greet visitors at Mount Rushmore. 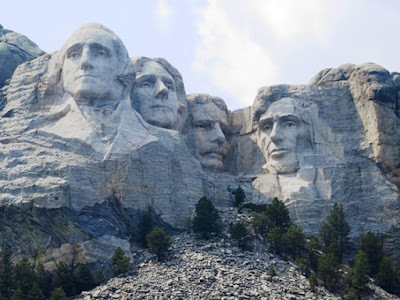 Mount Rushmore National Memorial is an enormous sculpture carved into the granite face of Mount Rushmore in South Dakota. Nearly three million people visit each year. I visited there in July 2015 and marveled at the majestic presidential faces and the importance of each man in America’s history. President who faced many challenges. The Lincoln Memorial was built to honor the 16th President, Abraham Lincoln. Located on the National Mall in Washington D.C., the marble statue immortalized the president who preserved the country during the Civil War and became known as the Great Emancipator. The Navajo National Monument, located on the Navajo Reservation in northern Arizona, preserves three intact cliff dwellings of the ancestral tribe called Anasazi. It honors the resourcefulness of our country’s early inhabitants, who learned to use what was available in nature to their benefit. Cedar Breaks is a national amphitheater canyon with incredible rock formations similar to the hoodoos in Bryce Canyon National Park in Utah. The canyon stretches over three miles and is more than 2,000 feet deep with a hiking trail on the rim that provides exceptional views. Grand Staircase-Escalante isn’t a single monument but almost two million acres of notable paleontological finds and stunning geology. The monument consists of the Grand Staircase, the Kaiparowits Plateau, and the Canyons of the Escalante—some of the most beautiful red rock landscapes in the nation and a stunning prelude to several national parks in Utah. Mount St. Helens, located 96 miles south of Seattle, Washington in the Pacific Ring of Fire, is the most active volcano in the Cascade Range. Its most recent series of eruptions began in 1980 when a landslide and powerful explosive eruption created a large crater. It ended six years later after more than a dozen extrusions of lava built a dome. one of the grandest landscapes in the West. Colorado National Monument is a gorgeous park near Grand Junction, Colorado. Spectacular canyons cut deep into sandstone formations in this area of desert land high on the Colorado Plateau. The park hosts a wide range of wildlife, and visitors can participate in hiking, horseback riding, road bicycling, and scenic drives. There are magnificent views from trails and the Rim Rock Drive, which winds along the plateau. Waco Mammoth National Monument is among the newest, established July 2015 to protect a wooded site near the Bosque River on the north side of Waco,Texas where the remains of 24 Columbian mammoths were discovered in 1978. A short walk from the visitor center leads to the original fossil location where specimens from this mammoth nursery can still be seen. See mammoth bones at this new national monument in Waco, Texas. As you can see, even though these sites are called monuments, there’s often more than just one component, and many are just as beautiful and awe-inspiring as national parks. So what is the difference? If you have a national park pass, it is good at any of the lands that NPS manages. Labels: Cedar Breaks, Colorado National Monument, Grand Staircase-Escalante, Lincoln Memorial, Mount Rushmore, Mount St. Helens, National Park Service, Navajo National Monument, Waco Mammoth National Monument.